According to Pew Research, 95% of Americans own a cellphone, and 77% of them have a smartphone. Specifically, 100% of Americans ages 18-29 own a cellphone. These devices aren’t just for calling or texting anymore. These mini computers mean people can search for a job, check their bank account, shop online or order coffee using a smartphone. Because of our constant cellphone usage, the “using or overusing” in the workplace debate arises. Employees can use mobile phones to increase productivity, customer service skills and availability. Yet the overuse of cellphones is prevalent, and with the average adult spending over three hours a day on their device, how do employers create a usage policy that’s both fair and strategic? Hiatuses are crucial for the health and well-being of your employees and your company. According to Forbes, breaks help personnel de-stress and recharge, and can bolster overall job satisfaction and productivity. 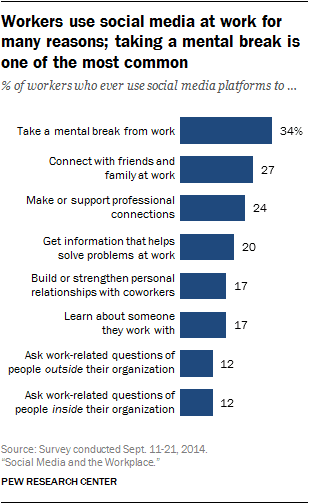 In fact, Pew Research reports that taking a mental break from work is the most common use for cellphones among employees. Your policy should outline the importance of those breaks. Consider creating designated cellphone-use spaces and providing charging stations for your employees. With society increasingly reliant on instant information, mobile phones can be used to the advantage of a company and its employees. Making a sale, solving a problem or interacting with co-workers can be enhanced through such use. HR technology especially benefits from mobile phone usage, as applications allow employees to receive important info and make changes from their devices. Even mandating HR tech usage becomes easier for employers if a cellphone policy encourages use for business-related purposes. Unfortunately, cellphone fatigue does happen in the workplace. OfficeTeam found that the average office employee wastes five hours a week using their cellphone for non-work activities. To increase productivity and exhibit fairness, employers should identify and enforce consistent penalties for overuse. Ensure these penalties are clearly communicated to your staff, and if problems arise, address them swiftly and firmly. The world surrounding the workplace is ever-changing. Encouraging the use of cellphones for business purposes can improve your workforce’s productivity and your organization’s bottom line. Kyle Bruce was named Paycom service manager in 2017 after holding team leader and supervisor positions. His department provides exceptional customer service to clients, helping Paycom achieve a client retention rate of 91%. A Lean Six Sigma green belt and former director of public service for the Oklahoma Secretary of State, he holds a bachelor’s degree in communication arts from Southwestern Oklahoma State University.